Lucy Stone (1818-1893), was one of the first Massachusetts women to graduate from college. She was an ardent abolitionist, a renowned orator, and the founder of the Woman's Journal, the foremost women's suffrage publication of its era. A different view of the memorial on my other blog. Good for her. Ms. Stone deserves to be cast in bronze and mounted on stone. It's a lovely way to remember her. To do all what she did in such times asked a lot of courage and strength from her.. I'm glad that there's a reminder of her, and such a beautiful one! Nice remembrance of Lucy Stone for her vision and activism on behalf of human rights. 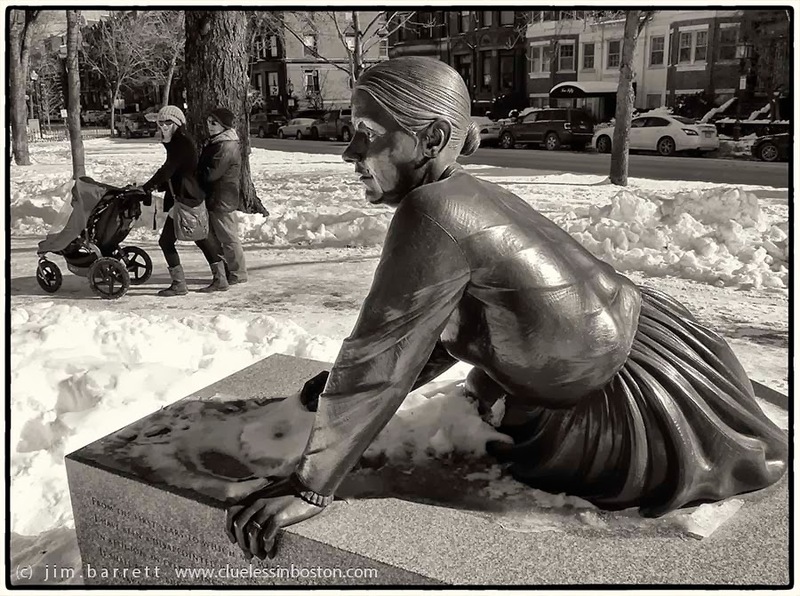 The sculptor has her gazing down Comm Ave looking ahead to a brighter future for women like the ones captured in this image. I don't remember this statue. Is it relatively new? Maybe playing catch-up . . .
What a lovely perspective. I like how you've captured the curious face on the face of the lady passerby.